Mike Delamore of the Bureau of Reclamation is trying to solve what seems an impossible problem: draining the salt building up on California's farmland while protecting water quality in the San Francisco Bay Delta. All's fair in smog and waste? A new Web site created by the Oakland, Calif., nonprofit Environmental Defense gathers information about environmental and health dangers in any community in the U.S. It's not easy being a person who lives in a high mountain ski town but hates snow and winter weather. Will Western skies be clear enough? The Western Regional Air Partnership has a plan to clear the air over the Colorado Plateau, but critics say the plan is much too soft and likely to prove ineffective. California has cut its landfill waste by 40 percent, and some give composting the credit. 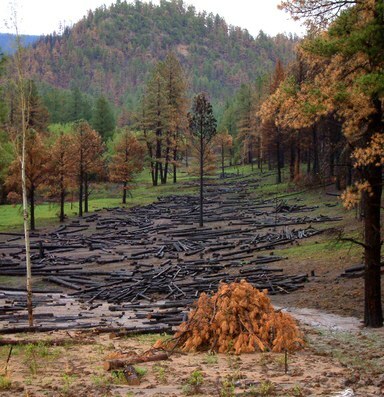 In the wake of the Cerro Grande fire, Los Alamos faces a new problem: how to prevent summer rainstorms from flooding the fire-denuded canyons and washing the laboratory's hazardous wastes into the Rio Grande. In a precedent-setting case, Allan Elias is convicted of "knowing endangerment" for exposing employee Scott Dominguez to cyanide in an accident that damaged his nervous system. The EPA orders the Potlatch Corp. pulp mill in Lewiston, Idaho, to cool its wastewater and reduce its pollution of the Snake River. In Washington, a tax-slashing ballot initiative is going to hurt the state's clean-air program. In Phoenix, Ariz., cases of "Valley Fever" are rising as rapid development stirs up pathogens in the area's dust.